Imagine a lifetime of never caring about the future or thinking about the past. Now imagine it being spread into two extremes, over past and future lifetimes, darkness and the Big Bang, enlightenment and space travel. How do you feel? Panic and fear that come out of our daily existence in the material body manifest through all sorts of spasms in the physical realm. It is in our power to heal the pain left to our inheritance and shown through Saturn, no matter the number of generations who buried their hurt inside it. 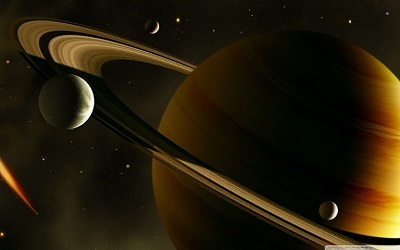 Vedic Astrology proclaims Sade Sati to be a period of seven years that transiting Saturn spends in the sign where our natal Moon is set, the sign preceding it, and the sign following it. Since it takes about two and a half years to move through one of them, the entire period ends in about seven and a half years, to be more precise. This is often referred to as the time for contemplation, solitude, and great sorrow, being named “seven years of sadness” for a reason. The contact of Saturn with the Moon is never easy, and depending on our natal relationship between the two, we will feel isolated and sad, a bit more or a bit less. While you might think that this is a time when only dark issues will stir up and negative things happen, this is never entirely the case. Seven years is a truly long period of time when many things might happen. A person could get married, have a child (and send them to school), finish college or enroll in a new one (and finish that one too). It is a time for learning lessons of life, and it will always be colored by circumstantial and important issues happening in real life, changing the routine of a person on a profound level. Sade Sati can be quite cold and depressing, pushing some people over the edge of psychological balance, and burdening others with difficult lessons of responsibility and solitude in life that need to be learned. While one might work too hard, the other could break a leg, lose a home, or simply travel far to find one. The specific manifestation depends on our natal positions and the relationship our ascendant ruler has with both Saturn and the Moon. Imagine one of your romantic relationships and think about the way you perceive it. Did you enjoy it or have you been burdened with all that it might lead to, or all that it once was? Did you relax, feet spontaneous and easygoing, ready to let go at any time? Probably not. It is in our human nature to hold on to things that make us connect with our own inner core. Those lucky individuals who spark our Soul to shine, easily make us dependent on their doings, and while it might seem like we are “building” our relationships from point A to point B, we are in fact holding on to stability and imagery of a bond that needn’t be what we perceive in the first place. Ultimate faith governed by Saturn reminds us that we are always in the right place at the right time, and we cannot ever make a mistake from its point of view. Avoidance of responsibility will push us into harder circumstances (and so will taking the fall for others), while acceptance gives us the sense of ease and makes it easier to connect with the magic of life and Mother Nature. The contact between Saturn and the Moon speaks of a contact between Time and our everlasting Soul, and from this perspective we must see that they live in Unity, day after day anyway. Our world of dualities will be shaken as our sadness continues, and this contact will teach us that there are things that stand against the test of time, written in our hearts. Every person will wander around the past while their Sade Sati takes over their emotional world, dig up every single feeling that needs to be resolved, and remember emotions that once were seeing them in full bloom. It is important to not get sucked into the loop here, for once we imagine this perfect bond from the past in all its idealized glory, we transfer it to the future to wait for us there, in hopeful expectance that we will return to the ideal time that was never ideal to begin with. What we truly remember is emotion. Imagine a small piece of your heart shed and broken, left behind in every personal and hurtful experience you ever had. These people who broke it still have its pieces, some threw them in the trash and some hold them as trophies, but whatever the case, it is in their hands instead of ours. To claim them back and heal the wounds in your heart, we must feel the beauty in all its glory, think of the best time we had with someone, things we miss the most and things we had to leave behind, and realize that this emotion we feel and memories we have shape their own space and time that once was. Nothing is meant to last longer than its lifespan, no relationship, construction, or human. Certain people are there only to inspire us and weren’t born to stay in our lives. Others are here to stay. Holding on to those who needed to part ways with us can make us sad and miserable for seven years. As with all things in life, perspective makes all the difference, for we might choose to cry and wallow, but we might also choose to be grateful for what we have, move to another phase of our life and form a foundation for a liberating future.